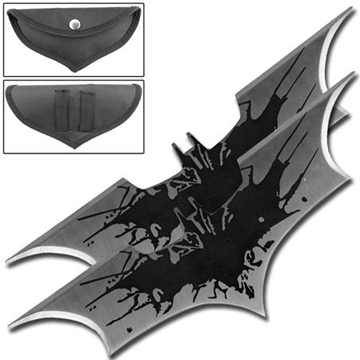 Largest Selection of Ninja Stars, Thowing Stars, & Shuriken! 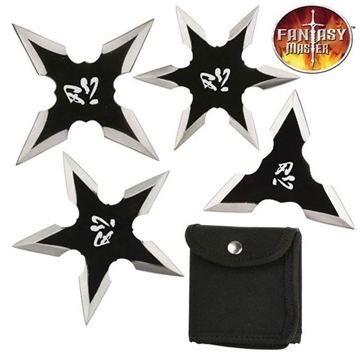 Ninja throwing stars have been around for many centuries, and are a trademark part of the traditional ninja arsenal of weapons. 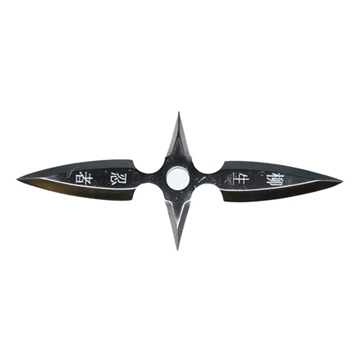 Known in Japanese as the hira shuriken or the shaken, the ninja throwing star is a flat, bladed throwing weapon with three or more striking points. 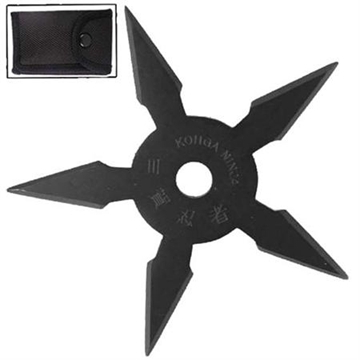 The ninja throwing star was not designed to be a lethal weapon; rather, it was usually used to disable or distract an opponent. 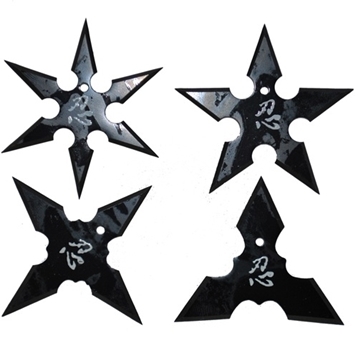 Shuriken, especially hira-shuriken, were often used by ninjas in novel ways—they might be embedded in the ground, injuring those who stepped on them (similar to a caltrop or makibishi), wrapped in fuse to be lit and thrown to cause fire, or wrapped in a cloth soaked in poison and lit to cover an area with a cloud of poisonous smoke. They can also be used as a handheld striking weapon in close combat. 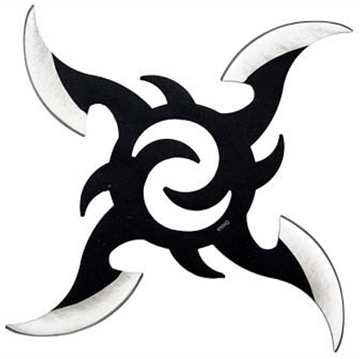 Ninja stars are extremely sharp and made of stainless steel or other very hard metallic material. Just like the ones Kabuto wields before the Genin exams in Naruto Episode #23. 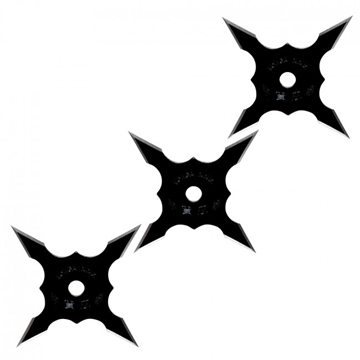 This 5 point 4" ninja throwing star comes with a carrying pouch and is available in chrome and black. 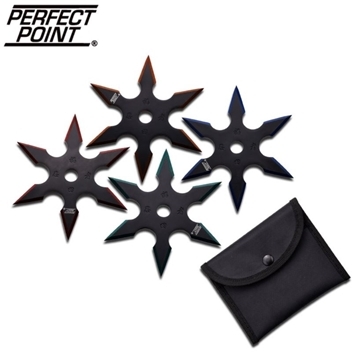 This 4 point professional throwing star set is built for maximum penetration. This shape is typical of the ninja stars used by the real ninjas in feudal Japan. Made of stainless steel, these stars measure 4 inches in diameter. Comes with a FREE nylon belt-strap carrying case. 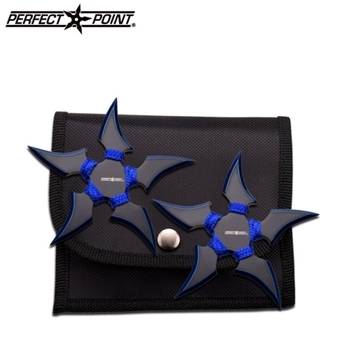 This 4 point professional throwing star is built for maximum penetration. 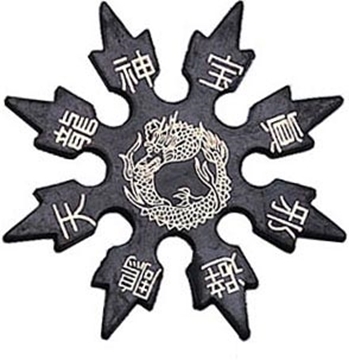 This is a typical ninja star used by the real ninja in feudal Japan. Made of stainless steel, this star measures 4 inches in diameter. Comes with a FREE nylon belt-strap carrying case. 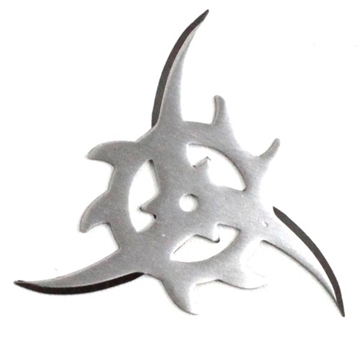 This is a 4 bladed throwing star with an amazing design similar to the sun corona. It measures 5.5" overall and each blade is 1.5" long. Black with silver edges. Featuring an awesome array of three black or chrome AUS-8 stainless steel blades styled in a cyclonic whirlwind. 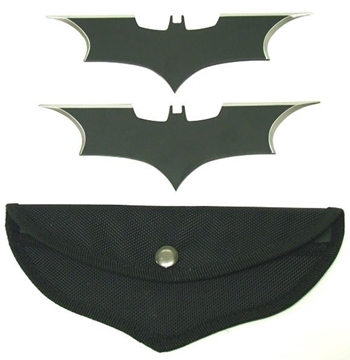 Each blade measures approximately 2 1/2 inches long and precisely closes into the aluminum handle. Includes pocket clip. 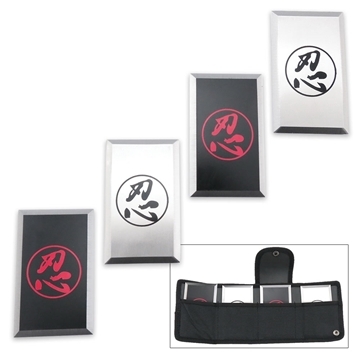 Japanese kanji adorn this new black and silver shuriken set from Fantasy Master.